OK, this one's going to be short and sweet. Like me! Kidding. I'm like 9 feet tall and I'm pretty sure no one's called me sweet since I was three. Also? When was the last time I ever just got right down to the recipe?? I had two huge leftover fried chicken breasts in the fridge. Don't tell anybody, but I don't like cold fried chicken. I know saying that is like spitting on the General Lee but I'm sorry, I don't like it. I like to make chicken salad with it. 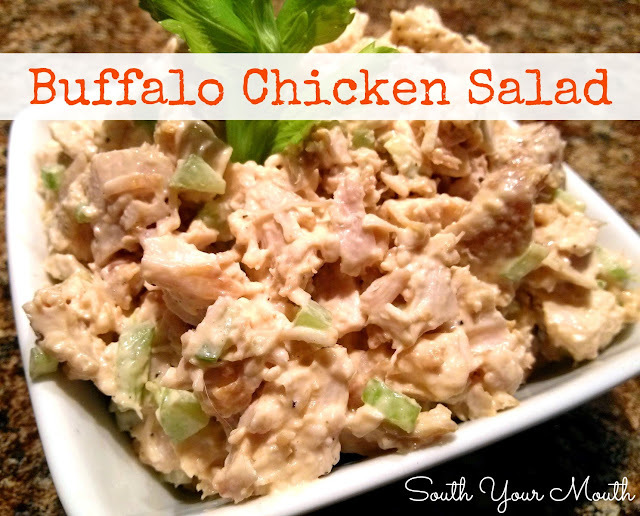 Don't be too quick to wrinkle your nose up at that... it's perfect for chicken salad! The chicken is super flavorful and the texture is awesome. Just pull the skin off and you're good to go. Those little crispy, fried bits are where the money's at! I usually make my chicken salad one of two ways; either super basic with just mayo, thyme, salt and pepper or super swanky with grapes or raisins and pecans. But today I had this gorgeous, leafy bunch of celery and it was talking to me. The next thing I knew I was thinking about chicken wings and voila, I made this Buffalo Chicken Salad. In a medium bowl, whisk together mayonnaise, hot sauce and garlic. Add chopped chicken, celery, salt and pepper then mix well. Serve with crackers and/or celery sticks. Consider serving with a wedge of bleu cheese brie too! Sounds weird, but this is good if you put chopped boiled eggs in it! Mash the yolks into the mayo and mix in the chopped whites. Great low-carb snack. Oh that sounds great...I love hard boiled eggs with my chicken!! Thanks for the idea! Thanks for this recipe Mandy! I am in love with anything buffalo chicken and will probably add in the boiled eggs and some blue cheese crumbles too! Love all your recipes. I have been a fan for a long time! I tried this last night and the family gave me two thumbs up. It came out really yummy.